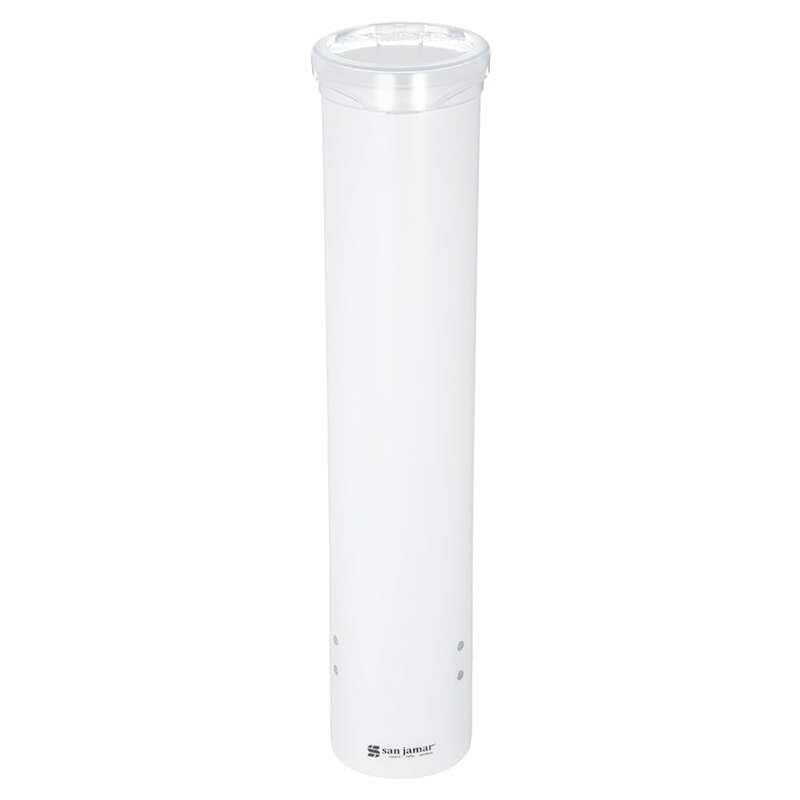 The San Jamar C4160WH water cup dispenser is 16 inches long and accepts cups with a 21⁄4- to 27⁄8-inch diameter. Cone-shaped cups have a capacity up to 3 to 41⁄2 ounces, while flat bottom cups can hold 3 to 5 ounces. This unit is great for water stations and can be mounted on almost any flat surface. 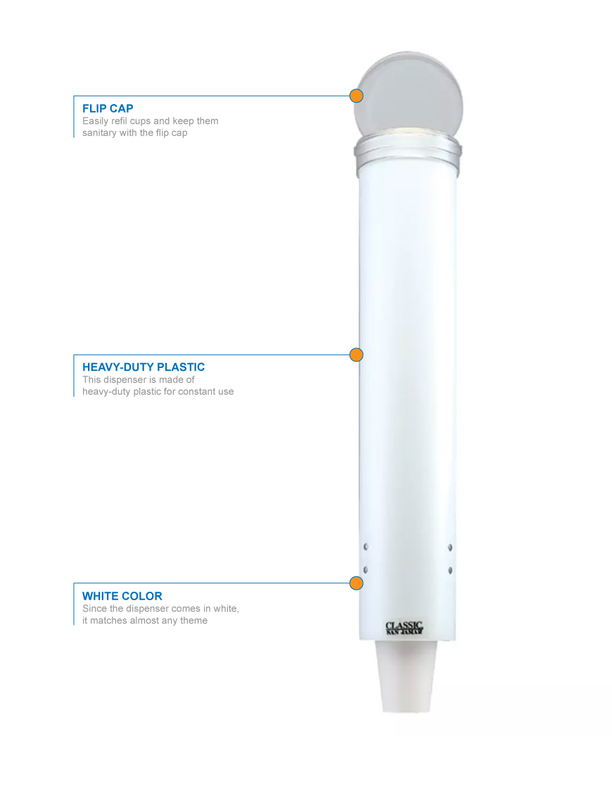 The San Jamar C4160WH water cup dispenser is constructed of white plastic for durability and the ability to fit into any theme. Accepts cups with a 21⁄4-27⁄8 in. dia. 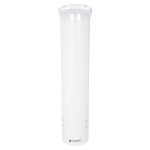 Classic Small Pull-Type Water Cup Dispenser, wall mount, self adjusting, top loading, pull type, fits 3 to 4-1/2 oz cone cups or 3 to5 oz flat bottom cups with rim diameter of 2-1/4" to 2-7/8", 16" L tube. Typically ships in 14 days. "With some modifications to the length (Shorten) to fit beneath a cupboard, this product is working well." "We just remodeled our bathroom and my husband prefers a wall mount cup holder. This is the only one we could find. It is larger than we would hav..."
"Did not realize "wall" paper cup dispensers are so rare anymore for homes. Having moved, we intended to have one in our "new" home. Gave up loo..."
"We just remodeled our bathroom and my husband prefers a wall mount cup holder. This is the only one we could find. It is larger than we would have preferred but it was easy to put up and it certainly holds a lot of cups!" "Did not realize "wall" paper cup dispensers are so rare anymore for homes. Having moved, we intended to have one in our "new" home. Gave up looking after 2 yrs. and finally found this one after looking online. A little bigger than necessary, but exactly right for convenience, neatness & sanitation. Thanks!"